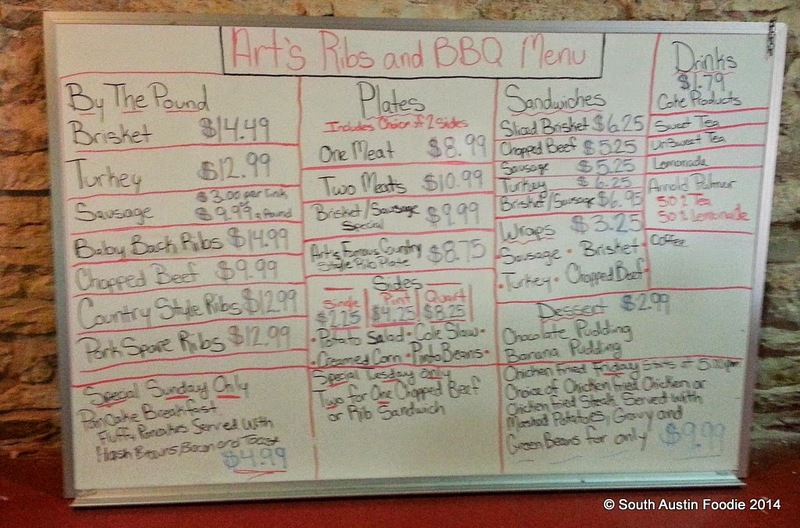 Ahh, I fondly remember the days of having Artz Rib House on South Lamar, less than two miles from my house. Sadly that location closed about two years ago leaving a huge void in my baby back rib consumption (here's one of my early blog posts on Artz). 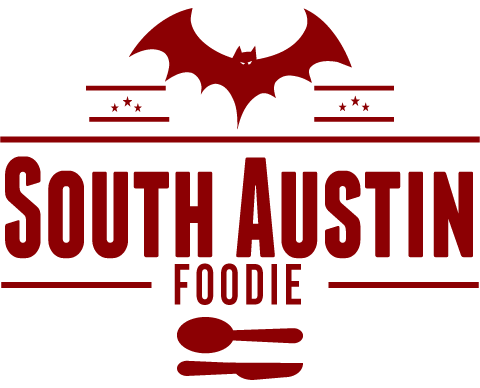 Not to mention they were a bit of a South Austin institution, with live music, much of it bluegrass, several nights out of the week. Owner Art Blondin has bounced around since the closing of his namesake, but it appears he's landed upright and is in business again. Head about an hour north my friends, to Florence, TX. Art found this building for rent on Craigslist; it was a former barbeque spot, and I am guessing it had all the right infrastructure to make it worthwhile. 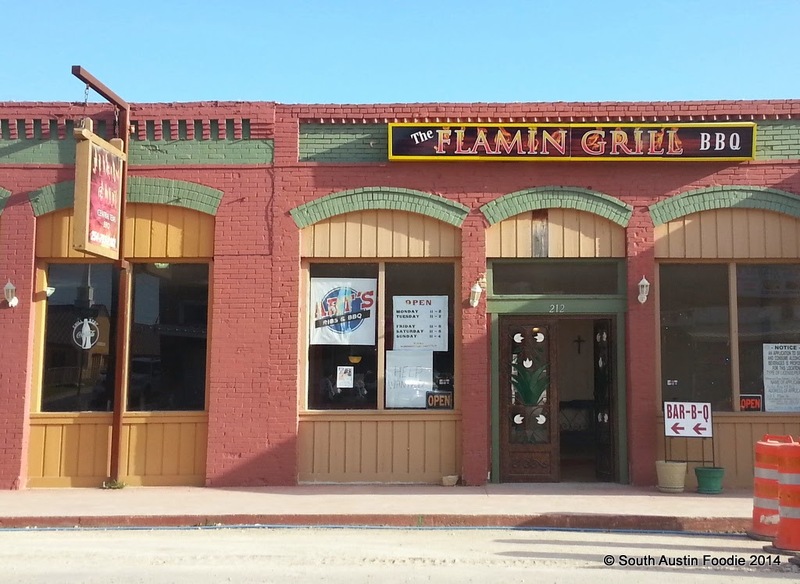 (Ignore the "Flaming Grill" part; you can sort of see his Art's Ribs sign in the window, and since I took this photo, he's gotten the hanging sign on the left replaced.) 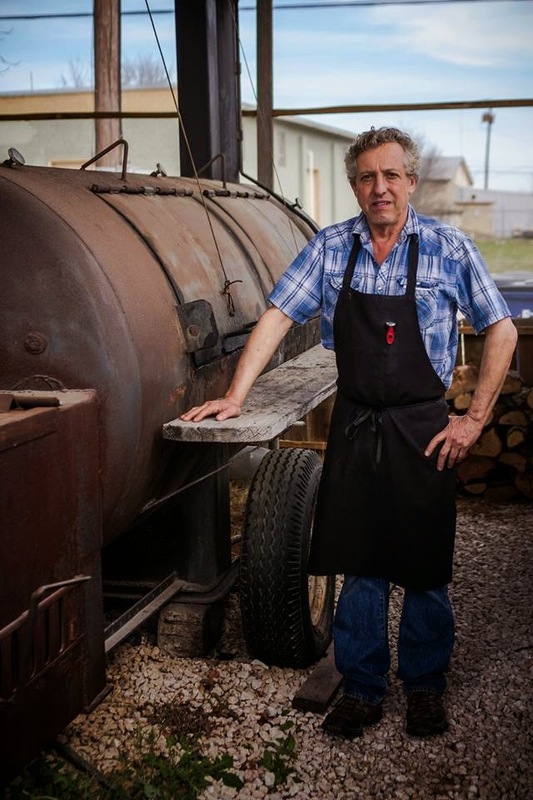 I visited the new Art's (slight name change from the one on South Lamar) last month, and got to see the pitmaster himself, whom I have been acquaintances with for a number of years. I wasted no time in getting my beloved baby backs, and they were just as good as I remember them -- tender, meaty, and just darn good. Art even commented on how the batch of baby backs we were eating were exceptionally large. And look at that smoke ring on the brisket and the ribs! The potato salad and cole slaw are solid too; both had good taste and consistency. Art was wonderful to bring us a pork loin chop that was fresh off the grill. Here you can see the before and after shots! 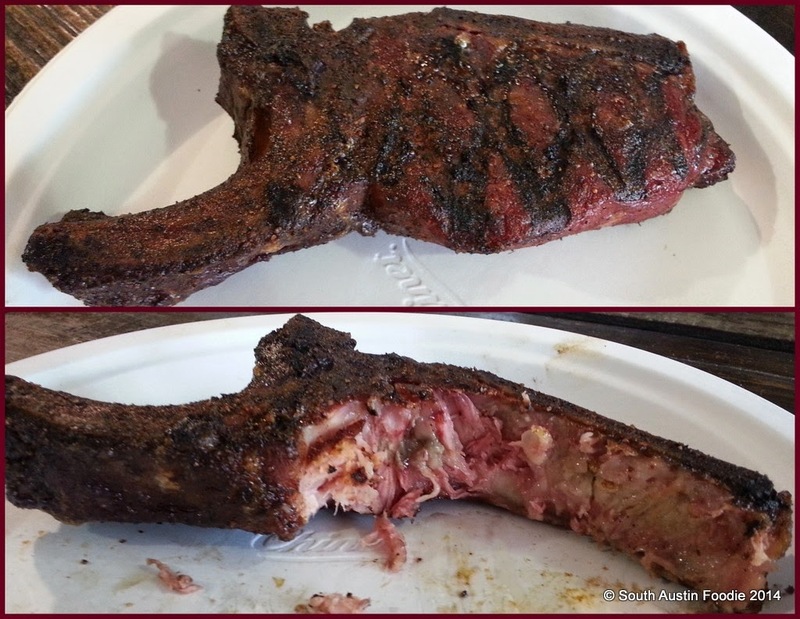 It was pure smoky meat, thick and juicy. It doesn't get a whole lot better! Here's a shot of the menu board. 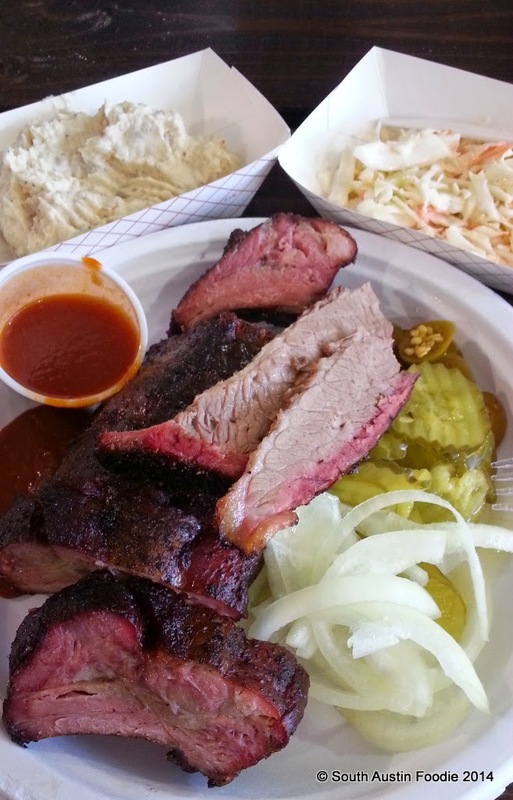 Prices are on par with other BBQ spots. And here's a great shot of Art with his smoker; this was taken by my friend Phillip Patterson, who has taken a number of pictures of Art and his new place, some of which are on the Facebook page. Photo by Phillip Patterson, used with permission. So PLEASE, do yourselves a favor and take a little drive north to Florence (Hwy. 183 to RR 138); they're located on Main Street (it's only about two blocks long) and you can't miss it. 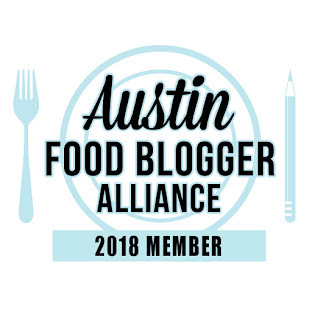 If you're a pork rib lover, this is absolutely the place to be! Added Sept. 1, 2014: It is with great sadness that I share Art's unexpected passing this past weekend. I have no idea what will happen to the restaurant in Florence, but with no Art.....Hope he's enjoying some baby backs wherever he is. Looks like it was absolutely worth the drive! He must have been so happy to see you.